SoftPlanet makes it possible for everyone to get free McAfee Stinger download directly from our servers. There is no registration needed for downloading. McAfee Stinger 12.1.0.1374 is a small-sized anti-virus program that is extremely easy to install and use. Developed as a small and light application this software provides basic anti-virus functionality for emergency cases. In addition this app can detect and remove specific viruses that plague computer systems. Despite its small size, McAfee Stinger 12.1.0.1374 makes use of the latest scan engine technology, including process scanning, scan performance optimizations and digitally signed DAT files. People require fast results and fortunately McAfee Stinger 12.1.0.1374 does deliver. The program is very, very fast when scanning and will be done in 1-2 minutes. It also depends on the size of your hard drives and the number of files that you have saved on them but in any case the program is fast. In addition it offers two other crucial components – it installs almost in an instant and is very easy to use. It does not matter what or where – you can always feel safe with McAfee Stinger. 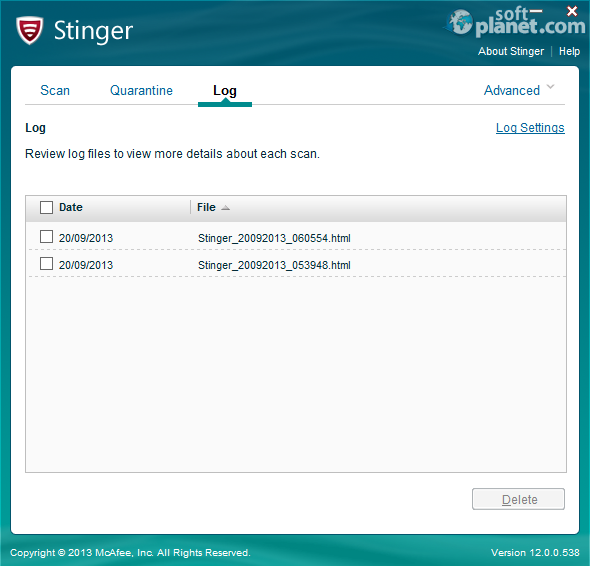 McAfee Stinger offers a rather strange interface. The program runs in a square window that you cannot enlarge or make smaller; it offers a simplified menu with Scan, Quarantine, Log and Advanced options only and they do not offer any extended functionality except from the one listed in their names. You can still customize your scan so there's a degree of flexibility in this program. The interface description concludes with a big red Scan button right in the middle of it – click on it to start scanning your PC. It is extremely easy to work with McAfee Stinger 12.1.0.1374 due to its small size and simplified interface. All you have to do is click on the big, red Scan button and wait for the results. Fortunately the program is very fast so it won't take long for it to display results. A serious downside to this program, however, is that there's no way to update it and that it comes with a limited list of viruses – hence the overall basic functionality of this app is somewhat limited. 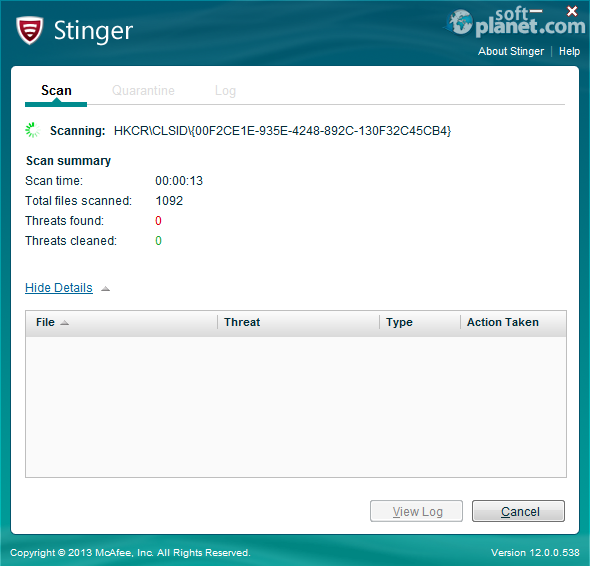 McAfee Stinger 12.1.0.1374 is a nice software tool for detecting and eliminating popular viruses. It is by no means a fully functional anti-virus program, coming with basic functionality and a limited list of viruses and malicious software but it will do the job in extreme situations. There's nothing to lose so why not try it – we are sure you will like it. 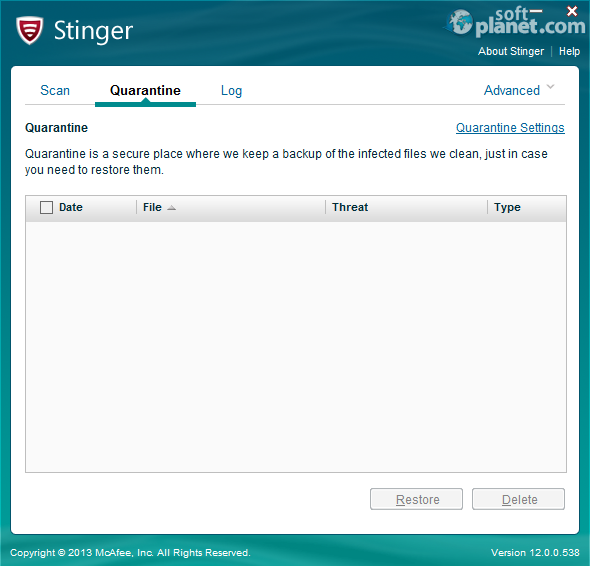 Our security scan shows that McAfee Stinger is clean from viruses. The current version of McAfee Stinger has been scanned by our system, which contains 46 different anti-virus algorithms. That ensures that McAfee Stinger 12.1.0.1374 is 100% safe for your computer.